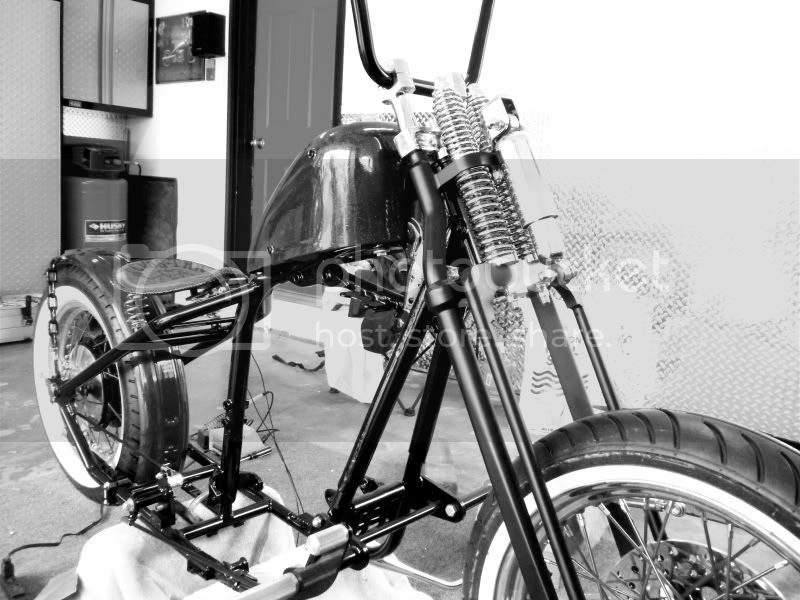 Roger Herring – RESERXSHUN — This is a bike that has really been a challenge to complete. What with various moves and re-directions I wondered if it would ever be completed. The name ReserXShun comes from the fact that it was scoured from so many different models & years. It is a heavily modified 1971 bike. As with all of my bikes everything was taken down to the bare frame, and all the modifications were done then it all got sand blasted & powder coated with a semi gloss black finish. The engine is from a ’78. The front end is from a ’79. The wheels & tank are from a ’74. The AKRONT wheels are shod with a set of vintage K70’s with a 450 out back and a 350 up front. The seat is a hand made unit I came up with and fabbed up out of fiberglass. The ’78 engine has been refreshed with a new top-end and a PAMCO electronic ignition & high output coil system installed. The bike breathes through a set of Mikuni round slides with K&N filters fitted to a WISEGUY intake manifold. The head pipes were also modified by WISEGUYS to accept the twin megaphone mufflers. It runs super strong!! A set of my hand made Mikuni headlights adorn the front of the bike and they really light up the night. A set of GN400 instruments give the vital info for speed & revs. Other unique touches include one of 8-ball dip sticks and a “surfer foot” brake pedal. Gas filled shocks from THUMPER STUFF handle the shock duties out back. Answer aluminum track bars carry the controls for the rider. Trick little bar end mirrors were used and provide a good rear visual for the rider. Modified engine cases were installed as were aluminum foot pegs. The side covers are courtesy of an old HP computer shell. The electrical system has been simplified quite a bit but the bike does have all the legal requirements like blinkers and such. An L.E.D. tail light tucked beneath the seat tail lets the folks in your rear see what’s going on. The bike is fully titled & tabbed until 2012 and ready to rip down the road. I love working on bikes in the house! Looks like a real fun rider, ever get it sideways on gravel roads ? And YES I have had the bike sideways several times…but not on gravel but in a big wet parking lot. Woo-Hoo..LOTSA FUN! !